Gerawat (second left) presents a certificate of ownership to Tuai Rumah Lajang Manggie, and witnessed by Anyi (back row, middle), Sherrina (on Anyi’s left) and others. MARUDI: Over 800 rural residents of 128 households in Linei Putih cluster, Tutoh near here can now enjoy round-the-clock electricity supply. The three longhouses set to benefit from this project are Rh Rok in Sungai Linei Ulu, Rh Lajang in Sungai Linei Hilir and Rh Asong in Sungai Tutoh. Mulu assemblyman Datuk Gerawat Gala said this was following the completion of solar power project costing RM7.8 million under Sarawak Alternative Rural Electrification Scheme (Sares). 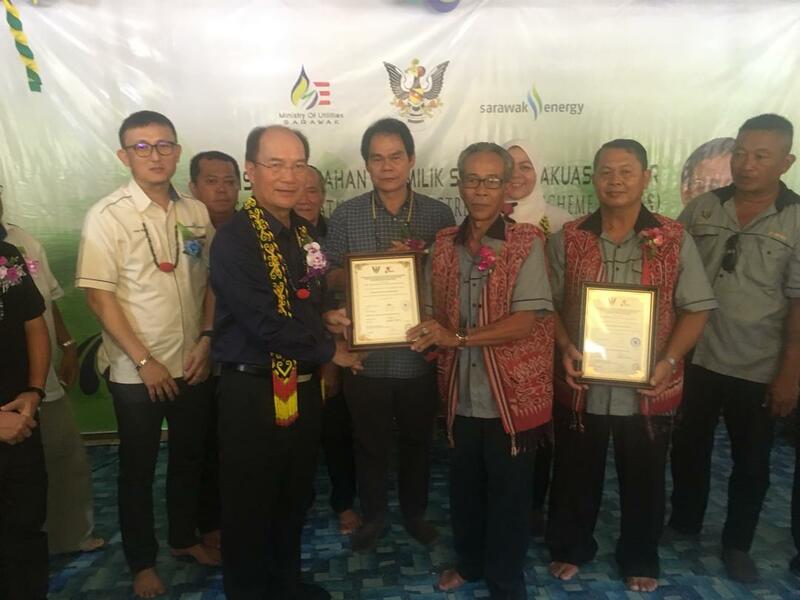 “A total of 128 households involving three longhouses in Linei Putih area in Baram can now enjoy 24-hour electricity supply through Sares. “The project, which cost RM7.8 million, will benefit approximately 128 households with 809 residents,” he said at the ceremony to hand over ownership of Sares systems at Rumah Rok today. Also present to witness the handing over of ownership certificates were Baram MP Anyi Ngau, Miri Resident Sherrina Hussaini and Marudi District Council chairman Cr Edward Mendai.